A few months ago I did a deep dive into Efficient Lightweight JMS with Spring and ActiveMQ where I focused on the details for asynchronous sending and receiving of messages. In an ideal world all messaging would be asynchronous. If you need a response then you should set up an asynchronous listener and either have enough state stored in the service or in the message that you can continue processing once the response has been received. However, when ideals lead to complexity, we have to make the decision of how much complexity can we tolerate for the performance we need. Sometimes it just makes more sense to use a synchronous request/response. ActiveMQ documentation actually has a pretty good overview of how request-response semantics work in JMS. You might think at first that to implement request-response type operations in JMS that you should create a new consumer with a selector per request; or maybe create a new temporary queue per request. Creating temporary destinations, consumers, producers and connections are all synchronous request-response operations with the broker and so should be avoided for processing each request as it results in lots of chat with the JMS broker. The best way to implement request-response over JMS is to create a temporary queue and consumer per client on startup, set JMSReplyTo property on each message to the temporary queue and then use a correlationID on each message to correlate request messages to response messages. This avoids the overhead of creating and closing a consumer for each request (which is expensive). It also means you can share the same producer & consumer across many threads if you want (or pool them maybe). This is a pretty good start but it requires some tweaking to work best in Spring. It also should be noted that Lingo and Camel are also suggested as options when using ActiveMQ. In my previous post I addressed why I don’t use either of these options. In short Camel is more power than is needed for basic messaging and Lingo is built on Jencks, neither of which have been updated in years. The first thing to notice is that its infeasible to create a consumer and temporary queue per client in Spring since pooling resources is required overcome the JmsTemplate gotchas. To get around this, I suggest using predefined request and response queues, removing the overhead of creating a temporary queue for each request/response. To allow for multiple consumers and producers on the same queue the JMSCorrelationId is used to correlated the request with its response message. Once the request/response logic was correct it was time to load test. Almost instantly, memory usage exploded and the garbage collector started thrashing. Inspecting ActiveMQ with the Web Console showed that MessageConsumers were hanging around even though they were being explicitly closed using Spring’s own JmsUtils. Turns out, the CachingConnectionFactory’s JavaDoc held the key to what was going on: “Note also that MessageConsumers obtained from a cached Session won’t get closed until the Session will eventually be removed from the pool.” However, if the MessageConsumers could be reused this wouldn’t be an issue. Unfortunately, CachingConnectionFactory caches MessageConsumers based on a hash key which contains the selector among other values. Obviously each request/response call, with its necessarily unique selector, was creating a new consumer that could never be reused. 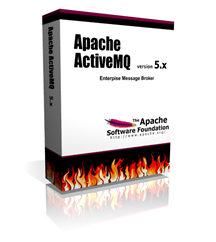 Luckily ActiveMQ provides a PooledConnectionFactory which does not cache MessageConsumers and switching to it fixed the problem instantly. However, this means that each request/response requires a new MessageConsumer to be created. This is adds overhead but its the price that must be payed to do synchronous request/response.